Hishaku Water Ladle and Chashaku Tea Scoop for Tea Ceremony "Out of Stock"
Long handled ladle made of natural bamboo 16-3/4 inches long, from end of cup to tip of handle. 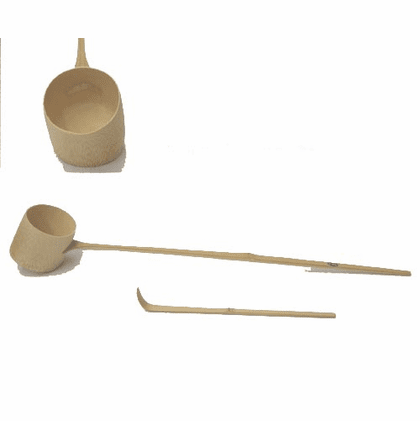 Tea scoop is also made of natural bamboo and is 6-3/4 inches long. Both are necessary utensils to use while performing the Japanese tea ceremony.